This is the 100th post of Off the Foul Pole — finally. I was stuck at 99 for quite some time and unfortunately, it took the passing of Ralph Kiner to get me to the century mark. As you may have noticed, I have not published in about six months. And it wasn’t writer’s block this time, although it had all of the clinical symptoms of such. And not that many noticed because my shrinking legion of followers all but left me for dead after too many extended periods of silence. Truth is, I got bored of whining about the Mets, my primary inspiration (exasperation?) for this blog. How many different ways can you express frustration, anger, sarcasm, cynicism, and dark humor over a baseball team from Flushing? Well, thousands actually, but I simply ran out of steam. Especially after Matt Harvey went down. That just convinced me (for the ten thousandth time) that this team is downright spooked. I also got distracted once the NFL season began (thank heavens I don’t blog about the Jets; that would make my obsession with the Mets seem downright giddy). On top of that, whatever time I had at night to write this blog was siphoned off by my new found addiction to Breaking Bad. I’m almost done binge-watching the entire five seasons. Just three episodes to go! Please don’t spoil it for me, although I kind of know what happens. So unless my addiction to Netflix intensifies and I start intravenously feeding myself on Homeland or House of Cards – which I might – I should have more time to dedicate to this space. That is, if I can conjure up the energy to spew poetically about the Mets once again. Something insidious is bound to happen during the first few weeks in Port St. Lucie to inspire me. But how could I remain silent about Ralph? He was part of the soundtrack to the first 53 years of my life. Whether he was struggling to pronounce Andres Galarraga or referring to Gary Carter as Gary Cooper or waxing nostalgically about Forbes Field or Enos Slaughter, he always gave you the feeling that you were sitting on the couch next to your life-of-the-party uncle while watching the game. He was a perfect complement to anyone in the booth, but it was his three-men-and-a-baseball role with Lindsey Nelson and Bob Murphy that was just pure sports broadcasting bliss. I wish those three could all have stayed together for 50-plus years. Kiner’s Korner, Ralph’s magnum opus, was one of the highlights of my childhood. Sadly but seriously. It was as low budget and unpretentious as sports television has ever been, but it was as engaging and entertaining as well. I just loved the idea that many of the game’s biggest stars, from Seaver to Mays to Aaron to Rose to Banks, would walk off the field and still in uniform, their hair matted with sweat, eye black smeared across their cheeks, and go sit down with Ralph to kibbitz for 15 minutes before hitting the showers. Imagine that happening today? Hey A-Rod, Kiner needs you for a few minutes! After Bell’s palsy left Ralph with slurred speech several years ago, he still took his place in the booth, albeit for fewer games. Initially, I thought, why the heck is he doing this? The guy was never the smoothest talker to begin with, and now we have to listen as he struggles with every word? I realized in time how selfish and inconsiderate that was of me (and many other fans, to be sure). Despite his impairment, Ralph never lost his wit, his insights, his folksiness. The fact that he would schlepp across the country to continue practicing his craft while his speech was so impacted told you one thing: this man loves the game and he wants to share his love with you every chance he got. How could you not admire that? His perseverance – his courage – deserved every ounce of our respect. 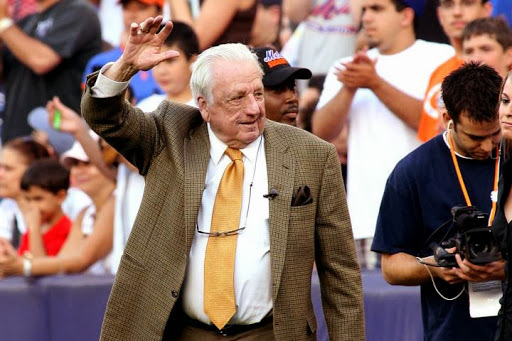 We were privileged that he continued to visit the booth at Shea Stadium and later Citi Field every year through 2013, even though his health was clearly eroding. Beginning this season, I think I’ll try something new: when my blood starts boiling and my brow turns downward over some ill wind blowing through Queens — maybe precipitated by Curtis Granderson’s plummeting batting average or Bartolo Colon’s ballooning ERA and waistline — I’ll pause for a moment. And I’ll imagine I‘m watching Kiner’s Korner. It’s 1975 and Ralph is having a good laugh with Tom Seaver and Rusty Staub after a big win against the Reds. And I’m laughing with them while washing down some Cheese Doodles with a bottle of yoohoo. That’ll make me feel good. And maybe I won’t be so poisonous with the pen. I might actually write something optimistic. And then I’ll go watch another episode of Homeland.